If you market, then you must explore the power of digital marketing. Digital media is growing exponentially. More and more people are getting hooked online in some form or the other. Social networks are growing at a tremendous rate. With this boom in digital media comes the opportunity to create your brand awareness and attract more customers. Today, the internet reach is about 300 million people. About 100 to 120 million people use social media and online platforms like Google, Facebook, Youtube, etc. Customers use internet for all sorts of purpose. They gather information for a product, compare options, search for deals, read reviews, etc. If your business is digitally active in the online world, then you will attract much more customers as they will read about you more often and learn more about what you do. Better than traditional methods of marketing. 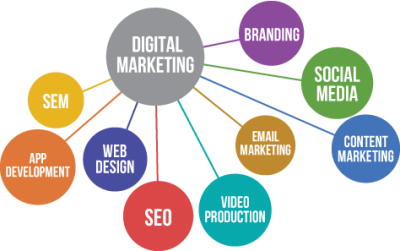 Digital marketing is far cheaper and faster medium of marketing than the traditional mediums like TV, radio ads or print media. It also ensures 24/7 availability of your company’s products and services. Digital marketing has much wider penetration covering beyond your traditional localized markets. It ensures easy access and stronger impact on customers as they can come back anytime to access information at their convenience. You can also utilize the power of digital marketing to extend support to your existing customers and regain their trust and loyalty. Digital marketing is nothing too complicated. Digital marketing is nothing but a number of strategies applied to increase your brand value and credibility in the online world. It is a way of establishing a relationship of trust with your customers. 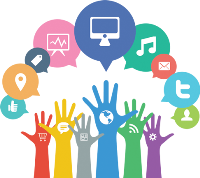 Digital marketing activities include techniques like web promotion, content marketing,social media marketing, influencer marketing, e-mail marketing etc. It is very important to have a dedicated website or blog that can provide all the details about your business. It will act like a building block and online brochure for your business. Let it be elaborate and content-rich to share as much as you want your potential customers to know. Flaunt your achievements, boast about your success in past, talk about your strengths, just about anything that you feel is worth publishing which will tempt a customer to contact you. Build a reputation, attract loyal customers. Along with Website and blog, other Digital Marketing strategies should go in parallel to increase your brand awareness and attract more users. Harnessing the capabilities of social media can do wonders to your market share. It helps in establishing a dialogue with the potential customers. It not only brings traffic on your website or blog, but attracts highly targeted traffic that delivers result. 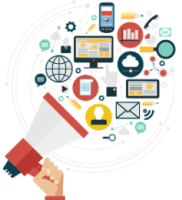 Digital Marketing supports a two way communication model. Use extended mediums like blogs, forums, and social media to interact with your customers. It allows you to have conversation with your customerwhich in turn helps in understanding your target audience and reaching out to masses.Use such mediums lavishly to the best of your advantage. Be Creative, Shout, go Social ! Digital marketing need creative techniques to instill your brand values on customer’s mind. Publicize your business creatively and aggressively through any and all online mediums available today.Go Social with your business and SHOUT about what you do. You will be surprised by the wonders it can bring to your business.